After a summer headlining main stages across some of the world’s finest music festivals and holding court at Hakkasan and Wet Republic in Las Vegas, Tiësto ups the ante this weekend as he gets set to perform six shows over a three day period. Dubbed “Never Ending Weekend” it all kicks off stadium style when Tiësto performs at the iHeartRadio Festival at the MGM Grand Garden Arena. 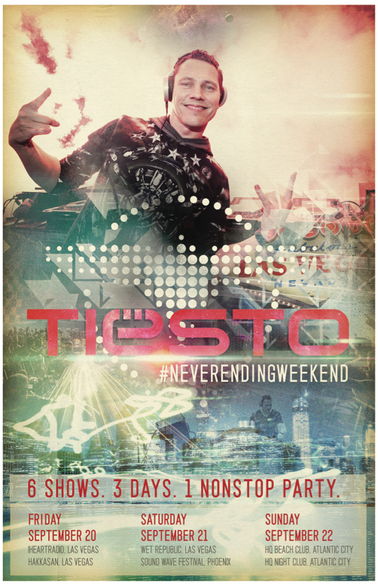 The performance will be followed by a set at Tiësto’s Las Vegas home, the Hakkasan Nightclub. The pool season is alive and well in Las Vegas, so Tiësto also performs an early set at Wet Republic before jumping a plane to Phoenix for a set at the city’s Sound Wave festival. Right after the festival Tiësto heads back into the skies for an overnight trip to America’s original seaside entertainment mecca, Atlantic City. He kicks off Sunday an earshot from the Atlantic Ocean with an early set at the HQ Beach Club before taking it inside for a late night set at HQ Night Club. If you’re attending any of the gigs, tag your status updates with #neverendingweekend.